A Missile Defense Agency (MDA) Ground-based Midcourse Defense (GMD) interceptor. 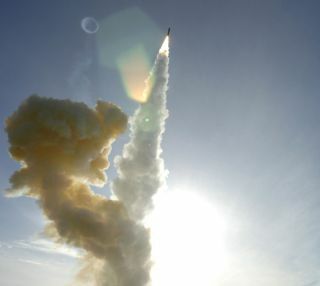 WASHINGTON — The U.S. Missile Defense Agency (MDA) on June 6successfully conducted the first flight test of a smaller version of itsground-based interceptor being developed as a backup option for a Europeanmissile shield, the agency said June 6. The two-stage interceptor launched from Vandenberg Air ForceBase, Calif., and delivered an operationalkill vehicle to a target point in space, as opposed to actuallyintercepting a target missile, an MDA press release said. Program officials arestill analyzing telemetry data from the test, but all indications are that itwas a success, the release said. The two-stage interceptor is derived from the three-stageGround-based Midcourse Defense (GMD) interceptors now deployed in Alaska andCalifornia to defend the United States against long-rangemissiles. The MDA and GMD prime contractor Boeing Defense, Space &Security of St. Louis were developing the smaller variant to be deployed inEurope to defend allies and deployed forces there, but the White House hassince changed course, relegating theinterceptor to a backup option in favor of the Raytheon-built StandardMissile (SM)-3 interceptors. Under a revised plan for European missile defense announcedlast year, U.S. Navy Aegis ships equipped with SM-3 interceptors will bedeployed to European waters in 2011. Land-based SM-3 batteries will bedeveloped and deployed in Poland and Romania in 2015. These interceptors have asuccessful test record against short- and medium-range ballistic missiles. A larger and more capable version of the SM-3, known asblock 2B, is needed to intercept long-range missiles and provide an additional layerof defense for the United States. It is being co-developed with Japan and isnot expected to be ready until 2020. Development of the two-stage ground-basedinterceptor will continue as a hedge against technological problems with thelarger SM-3 interceptor.